We get it. As a medical professional, you’ve got a whole lot on your plate already. Building a website is probably the last thing you want to add on top. But outreach and marketing are essential parts of any optometry business plan, particularly for doctors who are in private practice. That’s why optometrists need websites: You can’t make money if nobody knows who you are or where you’re working! In today’s all-digital-all-the-time world, getting “out there” means creating a web presence. And if you’re still not convinced that getting online can make a big difference in your business, well, we’re here to convince you — and give you the tips and tools you need to make yourself heard in the most efficient, effective way possible. For many business owners and marketers — optometrists and otherwise — creating a Facebook business page can seem like a simple solution to the “online presence” problem. And don’t get us wrong, having a Facebook page is a good start. But let’s face it: not every patient is “new school” enough to have an account on Zuckerberg’s hivemind. And you want to ensure you reach every potential client who needs your services! When you have a website of your own, you have total control over how it works and what it looks like. After all, you know best what appeals to your clients and what services you offer that make you stand out from the crowd. What’s more, when you have your own website, you actually own your content. So long as you’re paying for your domain and hosting package, your website isn’t going anywhere — and the content isn’t putting money into someone else’s pocket. By the way, did you know that 91% of adults use search engines to find information… and that it only takes 50 milliseconds for them to decide whether or not to stay on your site once they click through? Clearly, having a professionally-designed, search-optimized website can be a major boon to your business — not only to help you find new clients, but also to give them reason to take your practice seriously. A well-built website gives you a direct line of contact with existing patients and creates the outreach you need to take new ones into the fold. What’s more, this crucial part of optometry marketing doesn’t have to be expensive. We offer comprehensive packages including mobile optimization at affordable one-time fee prices, and ongoing maintenance at a reasonable monthly rate. So — have we convinced you that a website will catapult your business to the next level? Great! Now, let’s look at some of the elements a successful optometry website will include. Your website is your chance to wave hello to the world — so take it! Include a page introducing yourself to put patients at ease and prove there’s a person behind the phoropter. When choosing an optometrist, patients need to know what services are available, especially if you have a special area of focus. For instance, if you’re an ophthalmologist who performs optical surgery as well as routine appointments, this is a great place to showcase that information. Providing lay-level explanations of the regular procedures a patient might expect can also build confidence, and may even encourage a hesitant client to book an appointment. It’s up to you to decide how in-depth you want to go; this part of the website could be a single paragraph or span multiple pages. Even medical professionals know that the cost of care can be taxing or even prohibitive, and patients need to know what to expect when their appointment is up and it’s time to visit the checkout counter. Being upfront about your out-of-pocket rates and listing any accepted insurance policies will make planning easier for everybody. And don’t forget, rates and insurance plans change over time — so be sure to keep this page up to date! If you, like many other optometrists, carry optical frames and other goods for retail sale, consider including this information on your website. You don’t necessarily have to build out a whole online store… though doing so might help boost your sales totals. That’s another symptom of the whole “digital age” thing — everybody wants to do their shopping at home in their pajamas! 5. A way to get in touch! You do want your clients to make appointments, right? That’s what we thought! So make sure your website includes a contact page listing all the various ways you can be reached, including your phone number, email address, and physical location. You can even implement an online appointment booking system if you want to get seriously 21st century. Optometry Website Costs — It’s Cheaper Than You Think! Unlike other developers, we don’t make you go through a cloudy, time-intensive process to get a quote. Our pricing scheme is both affordable and straightforward, and you get to decide which level works best for your needs. Our basic package includes up to 10 pages of fresh, modern web design, including mobile optimization, for a one-time fee of $1,499. Your website will be up and running in two weeks. Our most popular package ups the ante to 15 pages, and also includes an SEO audit, content refresh service and online appointment scheduling buildout. This package costs $2,499. Our ultimate package includes up to 20 pages of custom development, as well as logo design, five pages of professionally-written content, and a branding and marketing strategy session — all for a one-time fee of $3,499. We also offer ongoing maintenance, including free site updates, regular backups and monthly analytics reports, for a monthly fee of $99. As important, but often-overlooked, members of the medical community, optometrists need websites now more than ever. Having a digital footprint can mean the difference between flourishing and just getting by. 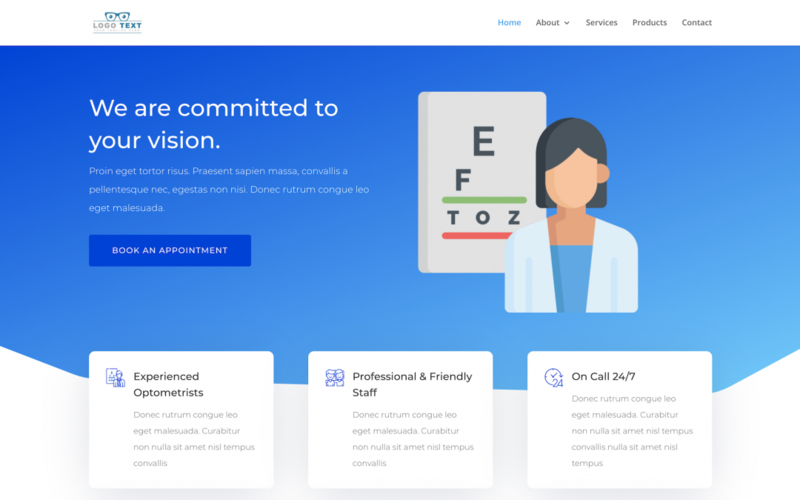 For more information on how a website can fit into your optometry business plan and what that website needs to be successful, please don’t hesitate to reach out to us directly. We’re looking forward to meeting you and learning more about your practice!